For years my favourite rollerball pen has been the Mitsubishi Vision Elite and it still holds a very dear place in my heart. Recently, however, I’ve been enticed by the fine-nibbed charms of the Mitsubishi Eye Needle. I think Andrew brought one home from work and I liked it so much I bought a pack for myself. Perhaps I’m imagining things but its spider-thin nib gives me at least an illusion of complete control. It’s a fraction finer than the Vision Elite and not quite as fluid, so writing with it gives me the sensation of applying a miniscule amount of more pressure and this feels rather satisfying! As for a notebook, for the past year my favourite has been Ryman’s Medium Soft Cover Notebook. It is the perfect size to hold in my hand and write in so it’s great for when I’m travelling by train or not sitting at a desk. Actually, when I’m at home, I rarely write at a desk or table – I tend to move around the house and write in a comfortable chair or sofa or on my bed. I also write in the kitchen, standing up, while I’m cooking. 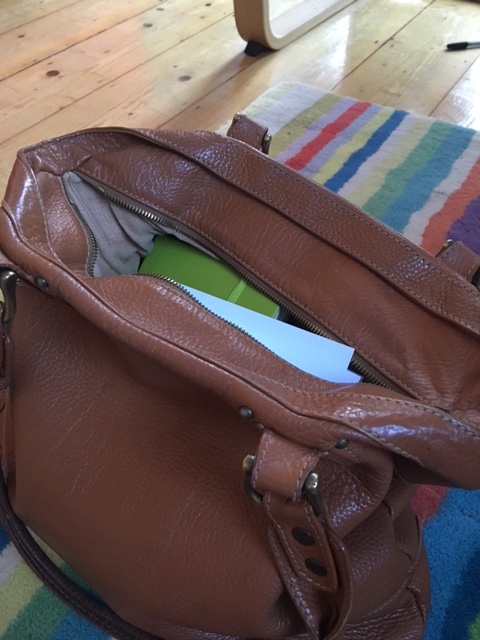 I love the fact that it has a ribbon page marker, a loop to hold a pen, an elastic to keep it closed and an expandable pocket in the back to store any loose pieces of paper. The cream-coloured paper is 70gsm. It’s a good size to fit into my bag so I can always carry it with me. I tend to buy it from Ryman’s in Bath which sometimes has buy one get one free offers (it sells for about £7 – and I’ve just checked online and it’s currently on offer). My one criticism is the colour range which is slightly lurid. I’m not a fan of sombre-coloured notebooks, though. When you spend so much time with a notebook, a splash of colour lifts your spirits. How about you? 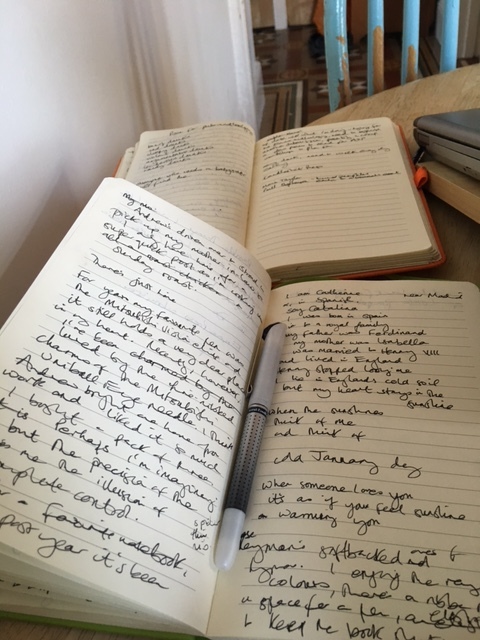 Do you have a favourite pen and notebook? 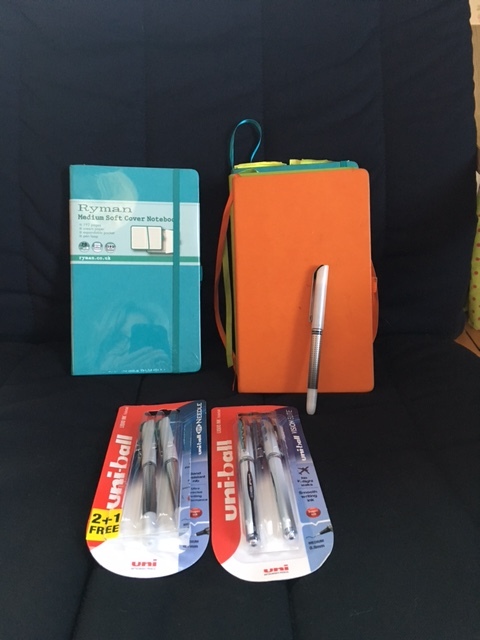 Ah, now you’re talking my language – I am obsessed with stationery and pens. I still have to find the perfect pen, though. Just imagine how exponentially my writing would improve if I had the perfect tool for it! 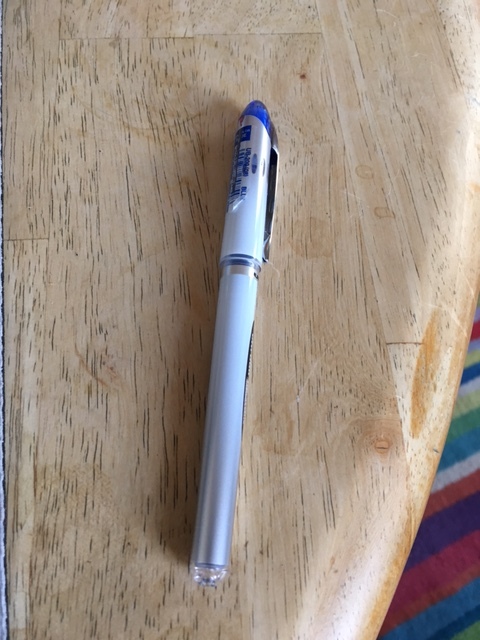 For me, the smoother flow, the better, but for the time being I find that the Pilot G2 gel pen (0.7) does a reasonable job, and I also quite like the Uniball Rollerball pens (if that is what they are called). As for notebooks, I have a weakness for Rhodia’s orange and black notebooks (of all sizes and shapes, they fold flat as well, which is a bonus) – the paper is again super-smooth. Yep, I’m with you on this too. Believe it or not, I have a couple of pens that a dear, departed friend made especially for me and they are very precious indeed. They sound very special, Jean.